Mount Diablo Cyclists was established in 2014. We are a group of over 1,000 devoted and passionate cyclists. Our concern is the reality of near-miss and actual collisions involving cyclists. Our Mission is to Improve the Safety for All who enjoy the Roads on Mount Diablo. We believe in following the facts and allowing the facts to take us on a journey of discovery. If we misspeak, send us the primary documents to review and we will correct the historical record as needed. On a typical weekend day, up to 500 drivers share the roads with approximately 700 cyclists. The majority of vehicles on Mount Diablo are bicycles! Last year over 150,000 cyclists rode up Mount Diablo. According to the Bay Area News Group (10/2/15): "there is already too much blood on the hands of lax park officials. If they don't move quickly, there will be more." According to Channel 3 News (2/3/16: "it's only a matter of time before someone dies or gets seriously hurt." 3.) On August 8, 2017, we submitted a PRA request for MDSP Park Aide Schedules and received the doucments 68 days later on 10/13/17. In 2014, we asked Park Leadership if Park Aides counted cyclists as they entered the park at North and South Gate Roads; " No, we don't count cyclists." A few weeks later, we discovered all Park Aides work for Park Leadership and are required to count cyclists as they entered the park and record the data on a State Parks form. When we presented the evidence to Park Leadership, the response was: "we don't count cyclists, they don’t matter!" As a result, we submitted a Public Records Act Request for the Monthly Visitor Attendance Reports (DPR 449) from 2013 to 2015. We discovered that the "Free Day Use" category was almost entirely bicycles. According to the Bay Area News Group (8/3/15); "park officials say rough data indicates bikes probably outnumber cars now." According to the Mercury News (8/6/13), "State Parks officials said last week they have no figures available for bicycles in the State Park." On October 7, 2014, we published the Mount Diablo State Park, Free Day Use (cyclists) Report, which was reviewed and edited by Park Leadership. According to this report: "Mount Diablo State Park (chart below) has been significantly under collecting and under reporting by tens of thousands the number of park visitors (cyclists: road/mountain bike) from 2008 to 2014. According to State Parks policy, “Conversion factors should be established anew twice a year, on the assumption that there will be significant differences between figures relating to the recreation season and the off season.” Mount Diablo State Park should “make a survey in the same manner as described for Paid Day Use,” per California State Parks, Departmental Notice No. 96-24. 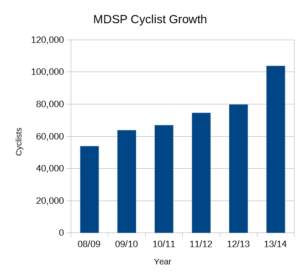 If an accurate process were implemented to collect Free Day Use (cyclists) data, the true number would be closer to 150,000, not the reported 103,804 for 2013/14. Publishing true and accurate Free Day Use (cyclist) historical data is essential for many reasons: it's the foundation for State Park and elected officials to make informed budgetary decisions concerning local State Parks and the overall Park system. Since 2014, we have asked for a report of an accurate count of Free Day Use (cyclists). To date that report still has not been provided. In January 2015, we began meeting in the Training Room on Mount Diablo monthly with Park Leadership. We continued to meet monthly throughout the winter and spring in the hope that Park Leadership would realize the daily threat to public safety and implement solutions. According to Channel 7 News (10/23/15): "State Park officials are taking too long to fix a dangerous problem that has led to bike vs. car crashes and serious injuries." 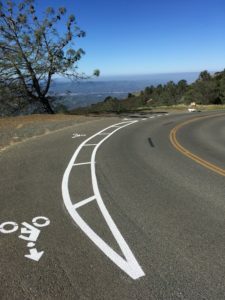 Unfortunately, after months of stalls and delays, we realized that Park Leadership didn’t seem serious about improving the safety for cyclists and motorists on the roads of Mount Diablo or implementing any changes! Promises were made but not kept, emails went unanswered, and multiple excuses were offered for both. According to the Bay Area News Group (8/3/15), "Unfortunately, they continue to meet bureaucratic foot-dragging. "As a result, we decided to contact elected officials, local newspapers, Bay Area TV stations, distribute a petition (1,225 signatures), gather public support and meet with local organizations. According to the Bay Area News Group (10/2/15): "Too much blood of bicyclists is spilled on Mount Diablo road,” and, "if they don't move quickly, there will be more." On April 2, 2015, we submitted a Public Records Act Request to State Parks for all Traffic Collision Reports from 2005 to Present. On April 17, 2015, we received 112 Traffic Collision Reports from 2010 to Present (4/17/15). According to Park Leadership: "(we) recommend contacting the California Highway Patrol to get a complete picture of all of the collisions on Mount Diablo State Park." Therefore, we worked with the California Highway Patrol and discovered that a collision was occurring on these roads approximately every two weeks. That equated to 25-30 collisions per year! Unfortunately, according to Public Records Act Requests, Park Leadership did not conduct any analysis of the Traffic Collision Reports from as far back as 2005 until April 30, 2015. We showed Park Leadership our analysis and offered to work with them concerning the 112 Traffic Collision Reports. We asked them if they met regularly to analyze Traffic Collision Reports or had implemented any safety recommendations. According to Park Leadership, "a Ranger fills out the Traffic Collision Report, it's reviewed by the Supervising Ranger and Park Superintendent, and then filed in a cabinet in Clayton." We even contacted the California Highway Patrol and arranged for Park Leadership to learn how to analyze Traffic Collision Reports hoping they would implement safety improvements. According to our research, there is no evidence that Park Leadership meets annually to collectively analyze Traffic Collision Reports. According to Park Leadership: "we just don't have the staff or the time to analyze them." According to Park leadership: "that's how it's always been and we see no reason to change." In addition, the only evidence we've discovered that Park Leadership implemented any safety improvements to prevent collisions from 2005 to 2015 was a sign. DMC (Diablo Multi-Sport Connection), all woman's cycling/swimming/running club initiated and funded two permanent and two sandwich board signs (8/16/13). All Park Leadership did was put the signs in the ground. Since 2015, we have met numerous times with Park Leadership and requested we work together to analyze Traffic Collision Reports. According to the Bay Area News Group(7/31/15), "Indeed, the accident reports understate the injuries. That's because accident victims often get transported off the mountain before the incidents are reported to park rangers." As of March 2018, Park Leadership has not seemed interested in collaborating to analyze the 161 Traffic Collision Reports from 2010 to 2017. We have also discovered that fewer than 5 of the 161 collisions that occurred in Mount Diablo State Park since 2010 were listed in the State of California Traffic Injury Mapping System (TIMS). Apparently, they are not included in the California Highway Patrol Statewide Integrated Traffic Records Systems (SWITRS) either. In addition, Park Leadership has told us they are not interested in working together to locate the 161 Traffic Collisions Reports on a Google Map. This would allow State Parks to identify the most dangerous curves where collisions repeatedly occur and perhaps install Bike Turnouts to prevent injuries and possible fatalities. We have made this request since 2015. 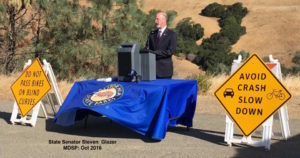 Frustrated by what we felt was a lack of sufficient concern on the part of State Parks, we met with State Senator Steven Glazer and Assemblywoman Catharine Baker in 2015. We showed them the Traffic Collision Reports, 24 of which documented Bike vs Vehicle Collisions.They quickly recognized a clear and present danger to Mount Diablo State Park visitors. As a result of their bipartisan leadership and the support of the public and the media, California State Parks was then pressured to begin implementing significant safety improvements for cyclists and motorists on Mount Diablo. 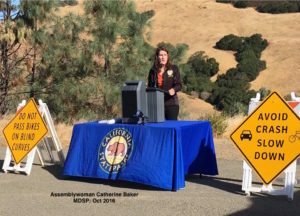 In 2016, funding was found to implement a Road Striping and Signage Project on the roadways of Mount Diablo, engineered according to Caltrans standards. According to the Bay Area News Group (10/2/16): "It's a welcome reversal from the foot-dragging just a few months ago." The new safety improvements of the project include: DO NOT PASS BIKES ON BLIND CURVES (35 signs), AVOID CRASH SLOW DOWN (35 signs), Bike Sharrows every ½ mile in the ascending lanes, additional STOP signs, revised warning/speed signs and Solid Double Yellow centerlines. In February 2017, we met with Park Leadership to discuss safety issues and near-miss collisions which occur frequently at blind curves. Uphill-bound motorists were still crossing the Solid Double yellow centerline to pass cyclists, with the possible result being a serious injury or fatality. However, we were told, " State Parks has done enough to improve the safety on Mount Diablo and we are not going to do any more." As a result, we once again reached out to elected officials, local media, created a web site, distributed a Bike Turnout Petition (1700 signatures), met with local organizations and gathered public support. 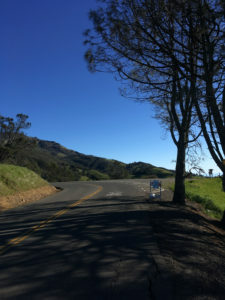 According to Park Leadership and supported by responses in our Motorists Surveys: "most motorists entering the Park have never been to Mount Diablo before and are unaware that they will share the narrow winding roads with hundreds of cyclists." According to Channel 7 News I-Team Investigation (10/23/15): “motorists are unaware of the over 369 curves, many of them sharp blind curves. According to Channel 5 News (9/13/16): "the beautiful ride on Mount Diablo can be dangerous, even deadly” and "greater challenge just staying alive." According to a State Park Report published in 1991: "over 90% of the vehicles observed crossed over the centerline to negotiate the curves." Mount Diablo Cyclists has worked closely with Park Leadership to address this issue. Now, the attendants at the North and South Gate kiosks are required to provide a Verbal Motorists Safety Advisory to all drivers entering the park. According to the Contra Costa Times (10/4/15): "Rangers must provide unambiguous admonitions to every driver." It is also unfortunate, according to Park leadership, most of these motorists who enter the Park before the kiosks are staffed do not stop to pay the entrance fee. In addition, there is no one available to make change, answer questions or give directions. The Park frequently opens the gates between 7:15- 7:30am. On many weekdays, Park Aides are not on duty at the North or South Gate Kiosks at all, or arrive at 10AM. Even on weekend days, when the kiosks are staffed at 8AM, there is still a gap of 30-45minutes when motorists may enter the Park before an Aide is on duty. 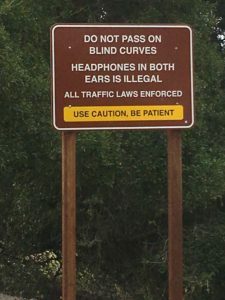 Therefore, thousands of drivers enter the Park every year without hearing the mandatory Verbal Motorists Safety Advisory. Thus they are unaware of the difficult nature of the roads, and the fact that many cyclists will be sharing those roads with them. According to the Bay Area News Group, there have been "countless Near-Misses." According to a Channel 7 news story, some cyclists report (10/23/15): "near-misses every third ride." We believe there are significantly more Near-Miss Collisions on days when the Kiosks are not staffed and the Verbal Motorists Safety Advisory is not given to drivers. We have discussed the staffing and Near-Miss Collision issues with Park Leadership since 2014. According to a Public Records Act Request, MDSP has an estimated annual loss in revenue of over $100,000 per year. Park leadership has said: "the Parks FY 2017/2018 budget for Park Aides is sufficient to fully staff the North and South Gate kiosks for the entire year." Mount Diablo Cyclists has also presented different staffing solutions to Park Leadership, including simply increasing the number of volunteer hours, thus avoiding any additional cost to the Park. In addition, we have suggested applying for funds from the State Parks Revenue Generation Program. Park leadership has assured us that providing the Safety Advisory to all motorists when the Park is open is a high priority. Park Leadership and Mount Diablo Cyclists worked together from 2016-2017 to design and install three Bike Turnouts as a pilot study. Bike Turnouts allow a cyclist pedaling uphill to move slightly to the right, thereby allowing a motorist to pass safely without crossing into the downhill lane, and possibly colliding with a descending cyclist. The majority of collisions occur on or near blind curves. As of January 2018, Park leadership planned to request an additional 64 Bike Turnouts and agreed to submit the Project Evaluation Form (PEF) to Sacramento by March 31, 2018. Since 2017, we have asked Park Leadership to replace the temporary Bike Turnouts signs (below) with more visible and permanent signs according to Caltrans standards. 48 Potential Bike Turnout Locations! On September 1st & 7th, 2017, Park Leadership and Mount Diablo Cyclists identified 48 potential locations for Bike Turnouts. In December 2017, Park Leadership added an additional 29 locations, for a total of 77. We believe that the ultimate goal of preventing Bike vs Vehicle Collisions, and the potentially fatal consequences thereof, more than justifies the investment. Many of these potential Bike Turnouts locations are where past collisions (160+) have occurred and will occur again if we do not act quickly to install Bike Turnouts on the roads of Mount Diablo. When in 2018 will State Parks install 10 additional Bike Turnouts on the most dangerous blinds curves? When will State Parks install permanent signs at the 13 existing Bike Turnouts? When will State Parks approve and fund the MDSP Bike Turnout Plan?